The 1.25" Celestron Variable Polarizing Filter allows you to control the amount of light transmitted through to your eye so you can tailor it to the brightness of the object you're looking at—reducing the brightness and glare on celestial objects like the moon, Venus, and even bright double stars. This filter does not alter the color of the object you're observing, making it a great choice for astroimaging, especially when imaging the surface of the Moon. By reducing the brightness, lunar details become more pronounced and defined. This filter can also be used to darken the blue-sky background when hunting for planets like Venus or Jupiter during daylight, making the planet stand out from the background. Simply rotate the filter's lower ring to adjust the light transmission from just 1% (blocking 99% of incoming light) up to as much as 40%. Having this level of control over the filtration allows you to precisely set it to a specific target and current viewing conditions so you can get the best view possible. 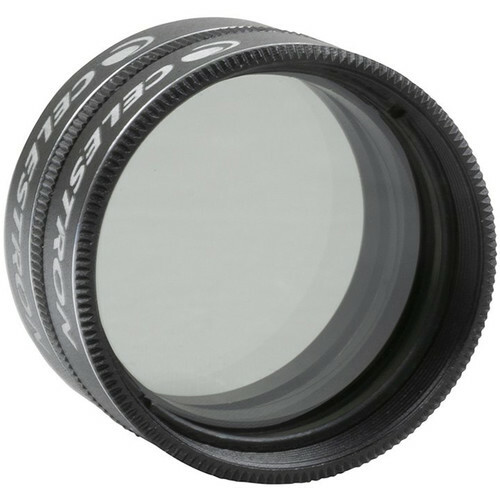 Standard threads on both sides allow it to be installed on just about any 1.25" eyepiece, and stacked with color or specialty filters to further refine and enhance the viewing experience. Front Filter Thread Size 1.25"
Box Dimensions (LxWxH) 2.8 x 2.8 x 1.2"